This structure, erected in 1984, pumps all the engine cooling water used in the Power House and Annex, the Power Tech Building and Annex, the Half Breed Pavilion, and Windy City. Its appearance duplicates an early 1900s structure. All cooling water, after it has passed through the engines, flows by gravity to a large concrete sump tank near the Pump House. Then its pumps return the water to the large tank on the hill, and with gravity feed, the cycle begins again. 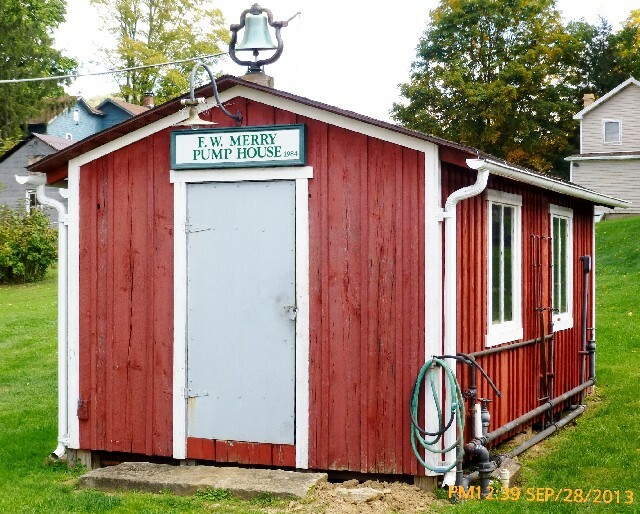 The Pump House is named in memory of Fred W. Merry. Fred was a retired civil engineer who moved to the area to help with the museum. He was a perfectionist and many of his designs and projects are still evident. He designed the initial water system and Pump House, which he carefully managed until he passed away. The F.W. Merry Pump House.